Being a copywriter I give more than a little attention to the names of fragrances and I have a profound allergy to clichés or arbitrariness. So this…baam. I would buy it just for the name maybe. You have to agree with me that the name is outstanding. So let’s not perform a semantic dissection on it. Let’s just embrace it. Sweet Redemption – The End. For obvious reasons I should have taken this one as the last fragrance of my Kilian-process, right? But I am also allergic to over-ordering things so, no. I have one left now. Over to the fragrance. It is very unusual. Definitely a very sweet very dark. 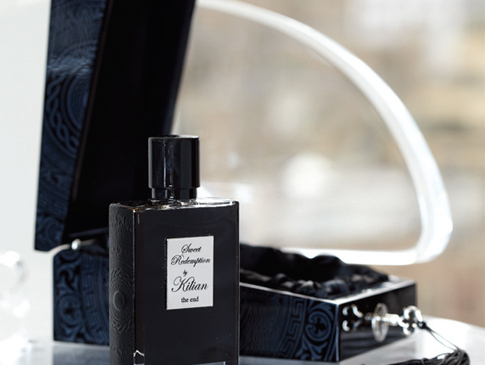 For some reason unfortunately you cannot find the formula on Kilians web as with the other fragrances so I have searched for other sources of information. According to Basenotes, the top notes are bergamot and bitter-orange leaf, middle notes are orange blossom, myrrh and frankincense and base notes are opoponax, benzoin and vanilla. The nose behind the fragrance is Calice Becker, who has created the majority of the fragrances of L’Oeuvre Noir. She describes the creation as “love without sexual tension“.